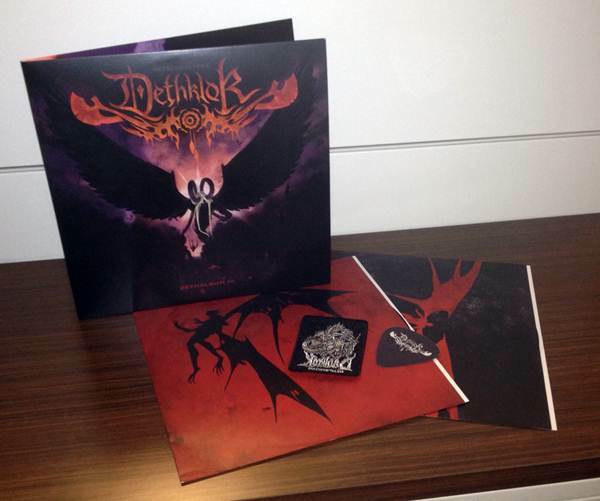 ‘Metalocalypse: Dethklok Dethalbum III’: Vinyl Edition Hits Stores Today! Last month, Adult Swim animated metallers DETHKLOK released their new album, Metalocalypse: Dethklok Dethalbum III, to a #10 Billboard Top 200 chart debut. Now, the public can experience the immensity of the world’s greatest metal band on vinyl! The vinyl LP edition of the album with special etching is available today via Amazon.com. Metalocalypse: Dethklok Dethalbum III was released on October 16, 2012 via Williams Street Records, the network’s independent music label. Metalocalypse: Dethklok Dethalbum III is also available in a variety of additional formats including a standard CD, clean CD and Deluxe Edition CD/DVD combo, which includes a 32-minute behind-the-scenes documentary of the making of Dethalbum III, as well as music videos and more. Head to www.adultswim.com/dethalbum3 NOW to listen to new tracks from the album, watch the music video for ‘The Galaxy’, and find information about the band’s current tour. Fans can also purchase the album at Best Buy and other retailers. Metalocalypse Season 4 is available now on DVD and Blu-ray Disc. DETHKLOK is currently touring North America on their headline tour with support from All That Remains, Machine Head, and special guest The Black Dahlia Murder. The Black Dahlia Murder will open each show, with Machine Head and All That Remainsalternating direct support positions in the line-up in each city. The tour officially kicked off this week, with the first three dates (Norfolk, VA, Philadelphia, PA and New York, NY) being rescheduled for the end of the tour due to Hurricane Sandy. For ticket information, please visitwww.adultswim.com/dethtour. See below for all upcoming tour dates. This entry was posted in Classic Metal, Classic Rock, Glam, Heavy metal, Internet Radio, Metal, Music, Rock, Rock N' Roll, RockStar, Sleaze, Tattoos, Thrash Metal and tagged 80's, All That Remains, Bleach Bang, Bleach Bangs, Bleach Bangs Radio, Charlie Owens, Classic Rock, Dethalbum III, Dethklok, Eddie's Mates, Glam, Glam Rock, Hard Rock, Heavy Metal, Machine Head, Metal, Metalocalypse, Music, Randy Norris, Rock, Rock N' Roll, Rock Star, RockStar, The Black Dahlia Murder, the Hellion. Bookmark the permalink. ← PHILIP ANSELMO and WARBEAST Release New Split Album ‘War of the Gargantuas’!! !